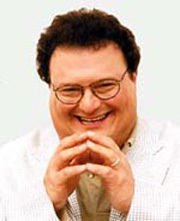 Wayne Knight began amusing friends with his celebrity impressions (including John F. Kennedy and David Brinkley) at the age of five. In high school, he became active in the drama club, and was selected for state-wide honors in the Georgia Governor's Honors Program, where academically advanced high school kids spend six weeks studying at college. During his stay on campus, Knight's group was taught by, among others, future President Jimmy Carter, Vietnam war architect Dean Rusk, and future NAACP head Julian Bond. During his "struggling actor" phase, Knight worked as a fruitcake salesman and private investigator, and years before Seinfeld he was a regular on the British sketch comedy show Assaulted Nuts. While overseas, he was befriended by actor-comedian Emma Thompson, and she still describes him as her best American friend in real life. The character of Seinfeld's nemesis Newman had been devised long before Knight got the part, and Larry David supplied an unseen Newman's voice on early episodes of Seinfeld. When the corpulent, scheming mailman finally appeared on camera, Knight went back and redubbed the early episodes with his own voice. The character never had a first name. Knight also played the heavy in Spielberg's original Jurassic Park, and romanced Kristen Johnston as the goofy Officer Don on Third Rock from the Sun. He is the voice of Mr. Blik the cat in Nickelodeon's Catscratch. Knight has lost a lot of weight since Seinfeld, dropping from 325 pounds to a svelte 215 after doctors warned of the health effects of obesity. In losing that weight, though, he has also lost a lot of work. After an unpleasant situation on a set, Knight now explains his weight loss on the phone before taking acting jobs, to be sure the thinner Knight is what producers want.